S11 Soundfield System with Wall Mounted Receiver. Why do classrooms need Trantec Soundfield Systems? 1. For the teacher to be heard, the teacher’s voice must be louder than the ambient noise. In many cases this means being louder than a coughing child, a passing vehicle, an adjacent classroom etc. 2. For the teacher's louder voice to benefit every student, they must all be able to hear, regardless of where they are situated within the classroom. Many classrooms suffer from poor acoustics, many teachers have softer voices and many students have differing levels of hearing ability, which vary temporarily as a result of colds and other infections. 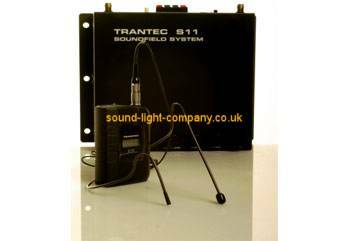 How does a Trantec Soundfield System work? A Trantec S11 wall mount receiver amplifier. 2 or more pairs of wall or ceiling mounted speakers complete with speaker cable. The teacher wears the lightweight S10 beltpack transmitter and microphone of choice. The S11 receiver can be wall mounted with Volume, Bass and Treble adjustment, allowing the teachers to determine for themselves the correct volume level for their classroom. The speakers are positioned around the classroom, to give an even coverage, enabling all students to hear. What are the benefits of a Trantec Soundfield System? All students hear what is being taught. This allows them to listen and to learn. This leads to improvements in levels of concentration, increases in attention span and a tangible reduction in disruptive behaviour. Teachers will be required to talk at lower levels, reducing the strain on their voice. This could lead to a reduction in the number of days absent from resultant throat infections. The above factors lead to a happy, healthy and stress free environment, in which both teachers and students can perform optimally. Why should I choose the Trantec Soundfield System? • UK Manufacturer, Trantec has been designing and manufacturing, high quality wireless products for many years. It should therefore come as no surprise that the S11 Soundfield System delivers the correct level of sound amplification, combined with clear and interference free speech reproduction. • As the installation of the Trantec S10 will be a significant investment for all schools, you will probably wish to purchase more than just a speech amplification system. As a result, the S10 Receiver has 2 auxiliary audio inputs to enable teachers to connect, cassette, CD, MP3 players, or even VCRs / DVD players and computers to the S10 system. We have also added a Mic/Mix mode to enable the teacher to provide a commentary over any audio input. There are also 2 audio outputs, to connect to larger sound systems or to an induction loop if required. • Many schools already have wireless hearing products, for there hearing impaired children. We wanted to integrate this equipment with the Soundfield system As a result, the S11 operates on the frequency bands reserved for this equipment and the S11 receivers are compatible, at the flick of a switch, with the existing Radio Aid transmitters. We have achieved this by working very closely with the UKs leading supplier of these products. • The Soundfield system allows the installer to select 1 frequency from a bank of 32 frequencies held within the transmitter and receiver. The Soundfield system is available in 3 banks of 32 frequencies, making it the most flexible product in the market place, and enabling it to be installed in even the largest of educational establishments.